Crop mobbing. It’s the new thing! No, I haven’t joined a gang. Or a cult. But I have come to a point in my life that allows me to admit the following–I am agricurious. If you have no idea what I’m talking about, please read on. 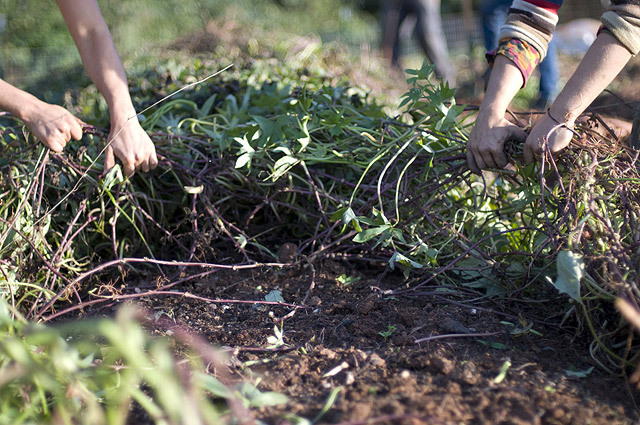 A crop mob is an event which allows a group of twenty-somethings to meet at a small sustainable farm near their metropolitan area to pitch in and do an afternoon’s worth of work, and through their combined efforts, accomplish a whole lot, especially for city folk. I first learned about crop mobbing a few months ago from a New York Times Magazine article. The idea of instant camaraderie as well as getting out of the city for a bit appealed to my inner ranch woman. There has been quite a bit of commentary and many new crop mobs have sprung up from the first one outside Chapel Hill, North Carolina. Even though I had been thinking about going for a long time, things never did work out (typical DC life excuse)…until yesterday. I carpooled to EcoFarms, just outside DC in Lanham, Maryland. It was a beautiful day for weeding, and weed we did. We were a well-oiled, sweaty but happy weeding machine. I carted wheelbarrow after wheelbarrow of weeds down to the compost heap, assured that no one in the world could have done the job any better than I was. How often does the DC young professional get to feel that? After an afternoon of work, the farmer provides a meal. Our appetites had already been whetted by the cool watermelon we ate under the shade tree during a break. I couldn’t decide if it was my hunger that made the lettuce so delicious or if it was just that fresh. Being around plants all day made me all the more mindful of the fact that what I ate was a growing thing just an hour earlier. I got everything I wanted–the camaraderie, the nature, the experience of dirt under my fingernails and seeing beds of weeds turn into beds of newly planted seeds, and a good story. For more information and to get involved, find DC Crop Mob on Facebook.